Nokia N500 is announced & its set to release at very affordable prices in Europe very soon. Recent news regarding the Nokia concentrating more of on the Windows phone 7 devices this phone is bit of relief for original Symbian & Nokia lovers. Nokia has made its place in consumers mind – as giving best hardware quality compared to any other phone in the market but the recent Android based phone capturing the market put some of very good phones on Nokia under ground. After staying calm for a while & slipping to fourth position in Cellphone & smartphone market they have started making news again b offering so many things all together in Nokia 500. Its not technically a review, but an overview we would like to share based on the chubby videos promoted by Nokia youtube page & so lets get right in to it.The very big & best news is this is first Nokia phone to come up with 1 GHz & Symbian together & comes with 3.2 inch capacitive touchscreen with 640×360 resolution. Its bit of a smaller screen but for the price they talking about its like best you can get. Again the phone comes with depressing MB of RAM which could have been boasted to 512 or something similar. Phone comes with 5MP camera, which is Nokia is good a (Higher megapixels with good quality) & you can share those videos and pictures to internet & social media as well. This powerful little smartphone comes with 3G connectivity (14.4Mbps HSDPA and 5Mbps HSUPA), Wi-Fi b/g, Bluetooth 2.1 with A2DP and EDR, and GPS (with A-GPS) , which is fairly amazing at its cost & you wont feel left out from any features of high end phones. 3.5mm audio jack on Nokia 500 will make it easy for music lovers & stereo FM radio is embedded as well. This budget smartphone from nokia comes with the amazing 2GB of built-in storage & and a microSD card slot that supports expansion up to 32GB. The phone has microUSB slot for data sharing with PC & laptops. The phone is going to be bundled with range of back covers that will make your phone look new every day & quite unique. The overall design & look of the phone is very clean as well as lovable. 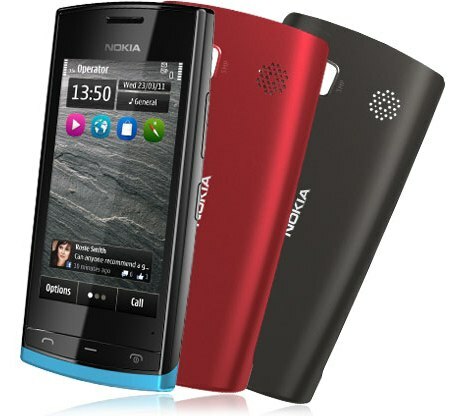 Nokia 500 is priced at 150 euros excluding the taxes. Exact market price is not out yet.